A major support and finance programme helping communities to take control of their local pub for the benefit of the community has been extended until March 2019, it has been announced today (Friday 23 February 2018) by Community Pubs Minister Jake Berry. More than a Pub: The Community Pub Business Support Programme was launched in March 2016 as a two-year programme in response to the large number of pubs that were closing and the impact this was having on the communities they served . The programme provides a comprehensive package of business development support, advice plus loan and grant funding delivered to community groups in England to help them establish community-owned pubs. Jointly funded by the Ministry of Housing, Communities and Local Government and Power to Change, the programme is led by Plunkett Foundation and delivered in collaboration with Co-operative and Community Finance, Keyfund and other leading organisations within the sector. The programme support made the difference between buying a pub and investing in More Than a Pub – we have stayed focused on our community purpose because of this. It would have been too easy to have done otherwise in the first year of a new commercial venture. Over 50 communities across England have already successfully taken ownership of their local pub, and a further 61 that are working with the More than a Pub Programme have been listed as ‘assets of community value’ under community rights, highlighting the important role that pubs play in local communities. For the 18 pubs opened under the programme so far, nearly 3000 local people have contributed an additional £3.7m in community shares . The programme offers a flexible package of support including access to an advice line, events, workshops, peer-to-peer study visits, and business development advice. It also offers flexible bursary awards to fund early stage activity, such as community consultation work, and a grant and loan package. encouraging volunteering, citizenship and community development as a hub for community groups. 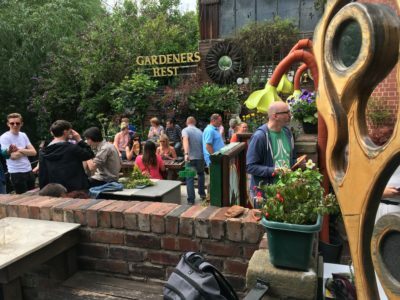 One such pub is The Gardeners Rest in Sheffield, which opened in October 2017 with over 400 local residents investing between £100 and £5,000 to become Society members – and democratic owners – of the pub, now being run for the benefit of the community. The group has developed The Gardeners Rest into a community hub with services and facilities beyond that of a traditional local. The pub now undertakes charitable work with vulnerable adults and people with learning difficulties, by providing employment opportunities and meeting space. It also continues to be a music venue with guest performers, as well as an activity centre and a place for local artists and photographers to exhibit their work. In 2016 CAMRA research showed that UK pubs were closing at an average of 27 per week. Over the last 10 years we have lost around a fifth of all pubs nationally. The term ‘community shares’ refers to withdrawable share capital; a form of share capital unique to co-operative and community benefit society legislation. This type of share capital can only be issued by co-operative societies, community benefit societies and charitable community benefit societies. Community shares can save local shops and pubs, finance renewable energy schemes, transform community facilities, support local food growing, fund new football clubs, restore heritage buildings, and above all, build stronger, more vibrant, and independent communities. More than a pub: The Community Pub Business Support Programme (www.plunkett.co.uk/more-than-a-pub) is a unique two year programme established to help support community ownership of pubs in England. Its value is £3.85 million and is jointly funded by the Ministry of Housing, Communities and Local Government and the Power to Change Trust. This exciting programme is led by Plunkett Foundation and delivered in collaboration with Co-operative & Community Finance, Key Fund, the Campaign for Real Ale (CAMRA), Co-operative Mutual Solutions, Pub is the Hub and Locality. It offers the community pub sector access to an end-to-end support programme including capacity building and a finance package made up of loans and grants. Power to Change (www.powertochange.org.uk) is an independent trust, whose funding is used to strengthen community businesses across England. At a time when many parts of the UK face cuts, neglect and social problems, we are helping local people come together to take control, and make sure their local areas survive and stay vibrant. The Big Lottery Fund supports the aspirations of people who want to make life better for their communities across the UK. We are responsible for giving out 40% of the money raised by the National Lottery and invest over £650 million a year in projects big and small in health, education, environment and charitable purposes. Since June 2004, we have awarded over £8 billion to projects that change the lives of millions of people. Every year we fund 13,000 small local projects tackling big social problems like poor mental health and homelessness.